This is a prototype website and a work-in-progress under constant update and re-design. The Digital Nitrate Prize is a cash award that will be given to the first individual or group to demonstrate a practical digital transfer and/or projection system that will in tandem exactly duplicate the appearance in all respects of classic nitrate motion picture film. In 2006, the inevitability of Digital storage and Digital projection as a replacement for the vast majority of Motion picture films is apparent. However, the push for low stoarage and trasnfer costs and expediency in the processes of storage and projection is already causing the loss of the special qualities and beauties of motion picture film as it can be seen under optimal, archival projection conditions which are rarely available to the general public in the 21st Century. The classic example of motion picture film at its peak is Nitrate film, especially high-silver black and white nitrate film: it exhibits clarity, richness, detail, an extraordinary range of Gamma and Grey scale, and other qualities that make the viewing of an extraordinary original nitrate black and white print from before 1950 a unique experience. The average person has never seen films projected in this way. If the current forces prevail, this experience will be lost. Technical forces and limitations make the preservation of these special qualities difficult and, some argue, impossible. Because motion picture film is impermanent, it becomes ever more pressing to find ways to preserve it properly through digital means. Based upon the X-Prize, the Digital Nitrate Prize proposes to use a cash award as an incentive to devolopers to find a solution to the problem of preserving motion picture film with all of its qualities intact. 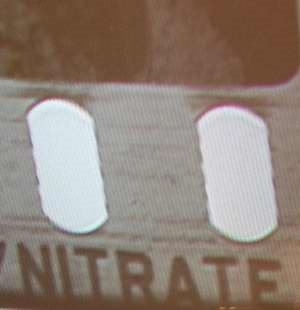 The Digital Nitrate Prize was proposed by Edward Summer in 2005. Originally offered as an activity of AMIA Association of Moving Image Archivists" that organization was not prepared to administer such a prize, so the prize became a separate entity. 2006 - A group is already formed to determine the rules of the competition and to continue to raise money for the prize. The currently stands in thousands of dollars, and the ultimate goal is to have the prize be six figures or higher. It functioned within the AMIA community of professional archivists for most of 2005 and is now independent. Like the X-Prize, funds are constantly solicited and the prize is augmented over time. Meanwhile... please join our Yahoo Group for continuing updates.